If you posted an audiobook review today, Wednesday June 23rd, please leave your link in the Mr. Linky before midnight Central time (US) and you will be eligible to win a prize. In 1951, Henrietta Lacks went to Johns Hopkins to undergo treatment for cervical cancer. While she was there, her doctors took a biopsy of her tumor. Although Henrietta would die soon after her treatment, her cancer cells, called HeLa, lived on. Her cells were cultivated in the lab and are still being used to this day by researchers. Henrietta’s cells have been all over the world, but her family hasn’t been able to get much of anywhere outside of the slums of Baltimore. The HeLa cells helped cure polio, but Henrietta’s family doesn’t have health care. “The Immortal Life of Henrietta Lacks” is a combination of Henrietta’s story, the story of her family, and Rebecca Skloot’s own journey trying to uncover the story of Henrietta and the HeLa cells. I am incredibly impressed with the way Rebecca Skloot wove this story together. I am a history major; although I read the occasional Discover magazine, I am certainly not a science person. Skloot managed to relate scientific information about the HeLa cells in a way that was easily understandable, but did not sound like she was talking down to me. She also managed to talk about what happened to Henrietta and her cells in a pretty balanced manner. Since Henrietta’s doctors didn’t get her consent for the biopsy – nor did they tell her family – her story is pretty controversial. Perhaps even more so because her cells have been so incredibly beneficial to researchers around the world. Honestly, I was not sure whether Skloot thought that what happened was a good or bad thing on balance, so thoroughly did she present both sides of the story. I have seen a few reviewers mention that they were somewhat disturbed by the way that Skloot badgered Henrietta’s family until they finally agreed to meet with her, that she might have been using them in much the same way that the scientific community used them all those years. I have to admit, the thought occurred to me as well. Sure, she was trying to do the right thing, to tell HeLa’s story, but the doctors at Hopkins – and all the researchers who used HeLa cells afterwards – thought they were doing the right thing for the world by using the HeLa cells, consent or not. Skloot did form a foundation for Henrietta’s decendents and – eventually – were happy to have her story told, but it did make me uncomfortable for some time. Overall, though, I’m really glad that I know Henrietta’s story and I do think that Skloot told it beautifully. It brought up so many issues of medical ethics that are fascinating and chilling to contemplate, I think it should be required reading. It would actually make a great book club book, because there is so much to discuss, which can’t be said for every science-based work of nonfiction. Cassandra Campbell was a fantastic narrator. She became Rebecca Skloot to me to the point where I was really somewhat confused when I saw a television interview with Skloot and she didn’t sound the same as Campbell’s narration. I was somewhat worried I would be less able to follow the science in audio where I couldn’t easily go back and reread, but I didn’t find that to be the case at all. 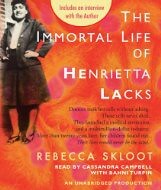 “The Immortal Life of Henrietta Lacks” also contains some sections narrated by Henrietta’s daughter Deborah Lacks. In this production, Bahni Turpin – one of the amazing narrators of “The Help” – narrated these sections, making it easier to feel that Deborah was really the one talking. Highly, highly recommended in either print or audio. The audio rendering was fabulous, but I have a feeling it wouldn’t be any less fabulous in print.